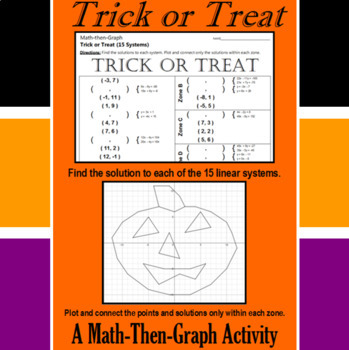 Celebrate Halloween with this festive coordinate graphing activity. Students solve 15 different systems of equations to complete the list of over 45 coordinate points. They should connect the points only within the designated zones. 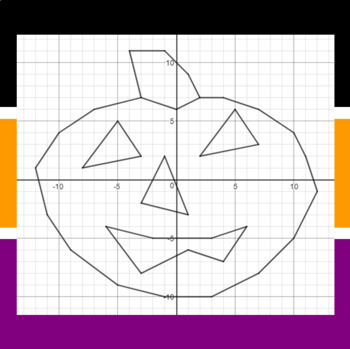 When they are done, they will have a picture of a Jack O' Lantern. 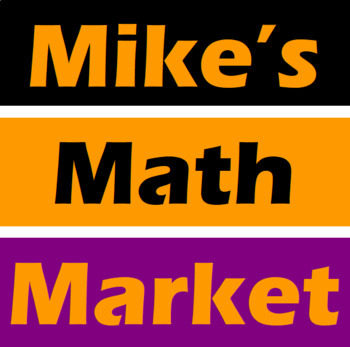 Don't forget to download a copy of my custom-made FREE GRAPH PAPER. All points will be on one grid line or another. A completed picture has been provided to be used as a key. You can download my custom made FREE GRAPH PAPER from my store. helps out, but any graph paper will do. If you like this Halloween Activity, you're gonna want to check out these other Halloween Activities. Or get them all in one convenient bundle. You'll save a Bundle when you get one of these other Bundles. 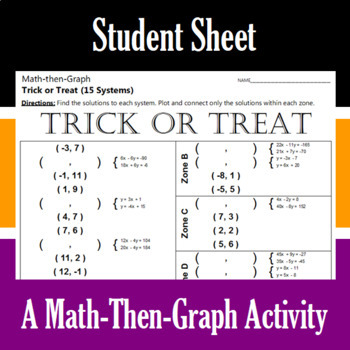 and Math-Then-Graph Activities at affordable prices.